Cup on the Bus: Not again! This is another of those ‘I wish I were what I was’. I’m on this continuum of living, but I’m missing the landmarks. I’m grateful to everyone who steps up and puts me on the right turn. I’m less disappointed in those who don’t. It’s a new quarter at school for Laura, come Monday. I realize I must not have been involved when all the registration for this year occurred. It would have been at the end of last year, this April or May. Or the beginning of this year, June, July. Whenever, I was not in the room when she was assigned a gym class that could have been this summer and a study hall, in lieu of a computer class. What’s done is done. I just finished tracking down her counselor. The same I went toe to toe with over Emily’s scheduling. You may remember this as the counselor who gave her no help in finding and applying for scholarships, and Emily and I did all the spadework. Dear god, why must I relearn all this, instead of having a practiced format. Another day with nothing to do and all day to get it done. Actually, this is the fourth weekday of this week. The big day was Wednesday, an appointment with my PC for a four month follow up, then Laura’s counselor. That was a good outcome, though. Then band practice, and done. At my doctor appointment, Dr. J said, “You know you’ve lost four pounds since I saw you last. Do you know why?” “Probably walking more,” I threw in. Life is better, for a month of Belbuca; I can walk a block and back. The truth is, I don’t eat enough, and was disguising it with ice cream. Hershey’s, two big scoops in a waffle cone, every Friday on the way home from taking Laura to marching band inspection. She’s not coming home tonight; she has a GSA meeting, then inspection and another damn football game. We’ll be home late and up early for her to volunteer at an aid station, passing out water to folks who run marathons for fun, on the towpath. Laura’s Gay Straight Alliance makes more sense than running on dirt trails, for fun. No school tomorrow, so Friday night football is Thursday, this week. No Los Angeles Radio Theater to listen to. I had texts to pick up prescriptions. I delivered my opinion of the quality of her work to the counselor who signed off Laura’s schedule, instead of me. I decided I needed a donut, and started a mental search for a shop with cream filled donuts, within easy reach. I needed gas, too, and stopped at Marathon. I glanced over at the store I never enter, and read the sign: Dunkin’ Donuts. I thought I bought enough for lunch and supper. I didn’t. Enjoy your doughnuts. Perhaps you can buy more today? Sigh on the going round in circles thing. Big sigh. There are NEVER enough donuts. I wish I could lose weight. I am so heavy. Love Dunkin' Donuts. We had them in Houston and when we traveled east, noticed them on every corner, but just read in the paper that they are opening one in Tulsa and I can hardly wait. Next time you go see PC, put a few rolls of quarters in you pockets. Learned that trick when hubby was at MD Anderson. You lost four pounds? Donuts sound like Doctor's orders to me! All you need is a jar of peanut butter and a spoon! I never eat sweets, can't afford the weight, if only you and I could trade weight gains. doughnuts are eminently preferable eaten hot and fresh...far better than those lurking on the shelves. You can afford those calories, Joanne. Hang in there. You've come so far! ...and the point here is that the 'counsellor' is not learning from her mistakes! I really hate it when people who are supposed to be assisting me are working directly against me. My battle abilities are lessening too. Why should I have to go to war now? I should be able to take it easy. Ice cream, delicious as it is, is no substitute for real food, but I sometimes do the same thing, so who am I to lecture you? I skip the cone though, and have my ice cream in a bowl, at home. Those doughnuts look yummy, I'm not surprised they didn't last long. Wow! You lost weight after eating that? You're right that they're not nutritious, but if you're not getting enough calories, it's good to get it where you can. I think. 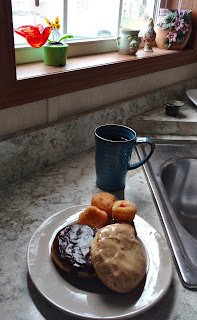 Now i want doughnuts so much.I can find them here only in December,ready for Hanuka,(the Jewish Cristmass... sort of,). That problem have I not. It is years since I ate a doughnut. Now, having seen your photograph Joanne, I desperately crave one. My sister-in-law doesn't eat enough. She drinks Ensure, and I send her gift baskets with snacks. If she won't eat a regular meal, at least she'll snack. Thanks for popping by my blog today, Joanne! I haven't had a Dunkin' Donut in years (that chain is not common in Canada but there used to be one in my former city) but I remember the donuts being good! 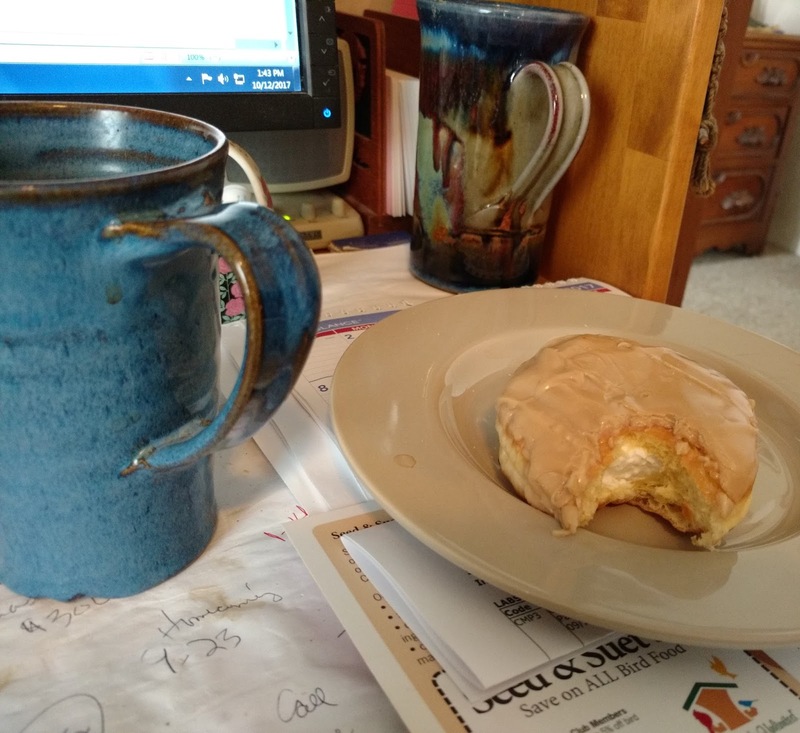 I know from my own experience that, no matter HOW many donuts one buys, there is NEVER enough for both lunch and dinner. substituting ice cream and donuts for a meal is bad. having ice cream and donuts after a meal is good. clean your plate Joanne or no desert! seriously. not eating is not a good sign. so here I am pointing out one of the landmarks you missed. With all the rushing around you do I would guess that is why you lost the 4 lbs, and nothing else. Bananas and lots of cream would be my choice ... in the unlikely event of my ever needing to be fattened up . But seriously , just sitting and relaxing after a meal is good for us all ... let the washing-up wait . DD is everywhere here in RI Must be why I don't appreciate them properly. That and this artisan donut thing that's trending around here. Yes, I paid $4.50 for a donut and I liked it. Once. Hang in there, Joanne. Buy more donuts or maybe some pie and hang in there. Yes to donuts for lunch and supper! !